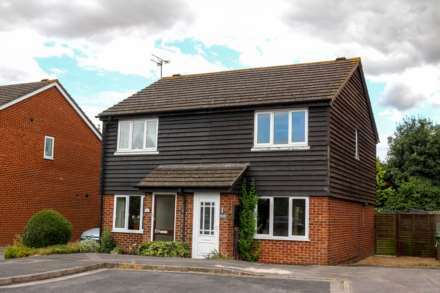 A semi-detached house built in the 1980`s and presented in excellent order throughout. There is an enclosed lobby leading in to the 14ft sitting room with double glazed window to the front, this leads into the kitchen/dining room with an archway dividing the two areas, the kitchen has fitted wall and base cabinets as well as a built in hob and oven, the dining area has a door to the rear garden. On the first floor there are two double bedrooms, the master bedroom is at the rear with fitted wardrobes and window overlooking the rear garden. The second bedroom has two built in cupboards and window to the front. The bathroom has a white suite, tiled floor and window to the side. The property has gas fired central heating and double glazing throughout. To the front of the property is a lawned front garden with private driveway to the side with parking and the possibility for construction of a garage subject to planning permission. To the rear is a neatly maintained garden with a paved patio area to the rear of the house, an area of lawn with flower and shrub borders. There is gated access to the side to the driveway. Situated within a mile of the centre of Wallingford. The centre of town has a variety of small shops, pubs and restaurants, the antique shops in the Lamb Arcade, and the parks, commons and gardens. There is a Waitrose Supermarket in the centre. The Country Market is held every Friday in the Regal Centre and the farmers Market is held every third Tuesday in the Market Place. The Corn Exchange is the home of Wallingford`s cinema and theatre, producing a wide variety of productions throughout the year. Three primary schools and a highly regarded High School which is also a sports academy. Wallingford is within easy reach of both the M40 and the M4 and only 15 miles from Oxford and Reading. The town has two nursery`s and a highly regarded secondary school, and a full range of leisure facilities and sports groups.